Dense forest and bamboo jungles in Asia and countries such as Indochina, Borneo, Java, and the Malay Peninsula. Mature males have a blue-black coat in colour, while females and juveniles are reddish brown with a dark dorsal stripe. The build is slightly smaller to that of domestic cattle, with a rather slender neck and small head. The horns of females are short, tightly curved and point inward at the tips, whereas the males have long, upwardly arching horns connected by a horn-like bald patch on the forehead. Both sexes have the characteristics of white ‘stockings’ on their lower legs, a white rump and muzzle, and white spots above the eyes. A gentle hump exists above the shoulders, and a slight ridge runs along the back. They can stand at approximately 1.55m at the shoulder and weigh from between 600 – 800kgs. 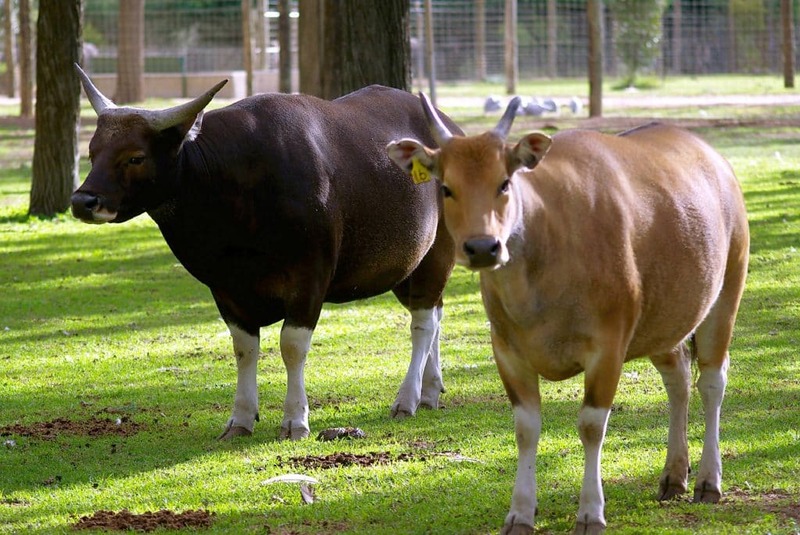 Banteng means “old bull” in Indonesian and are also referred to as Bali cattle. 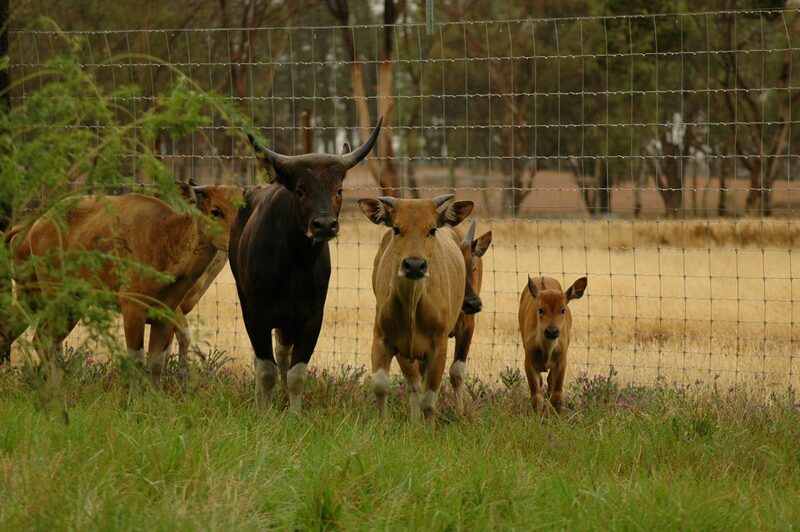 Group Structure: Banteng live in herds of 2 to 40 animals, usually led by an older cow and a single mature male. The male’s horns can grow up to 75cm in length. Diet: Banteng graze and browse mainly feeding on grasses, bamboo, leaves, fruits and young branches of woody shrubs, depending upon the season and availability. Where human activity is predominant Banteng usually adopt a nocturnal lifestyle except when kept in captivity where their safety is assured. Members of a herd will thump the ground with their front hooves if they are threatened and snort when alarmed. Banteng are very social and often are observed licking each other, strengthening the bond with the other individuals in the herd. 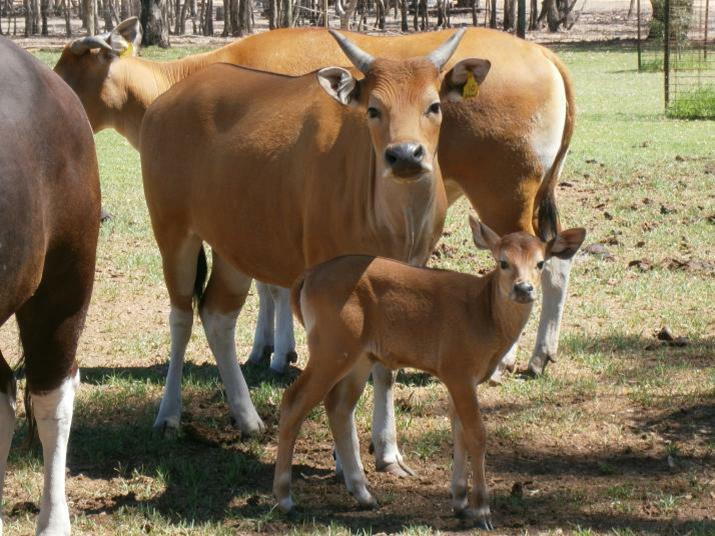 Only known wild population of Banteng exist solely in the Coburg Peninsula in the Northern Territory, the first Banteng were introduced to Australia in 1849. Lifespan: 20 - 26 years.